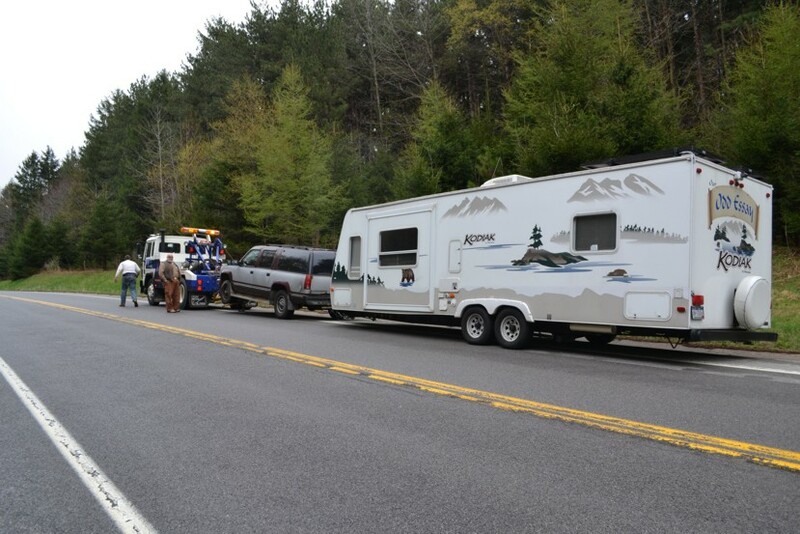 Jeff, the girls, and I arrived at our summer camp on Sunday, April 22 having barely survived the trip from hell. I have left it to Jeff to write about those experiences as I don’t really wish to relive the experience. When he completes his documentation I’ll reblog. It took me two days in bed to decompress once here. Another couple days to begin to engage in life fully. And two days ago I went to Pin Tangle to see what the stitch for this week was. I have over 30 six-inch squares of 14 count Aida cut. They were for Kissing Pillows, but I’ve slowed down on stitching them since there are fewer troops being shipped out (supposedly.) So what to do with all those extra squares? I pulled out my Studio Journal, and sketched out the wheat ear stitch to get a feel for it. (I also ordered a tin of pencils of varying density to aide my sketching from Blick Art Supplies.) Then I did some doodles beginning with a small sketch of a wisteria tree. It was a little too fiddley for me to get into so I started putting some lines in a square. Yup, a six-inch square. Then I saw a zipper that I had salvaged from one of Jeff’s favorite sweat shirts that was no longer wearable, one of the mindless tasks I did while I was restlessly trying to put the trip behind me. I liked the zipper a lot. The pull is kind of cool and has a nice feel to it, a nice weight and shape. A little different. People are doing cool things with zippers these days. 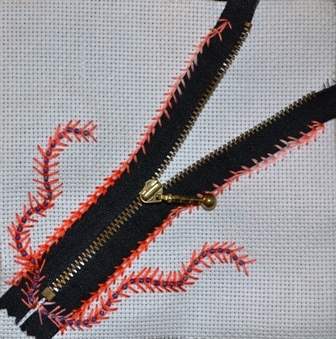 I wanted to do something cool with a zipper. I also need to have get some brightness, so lively color in my hands, in my heart. 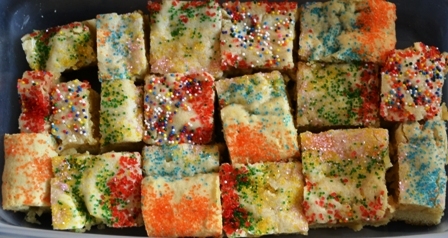 So much so that I made Bar Sugar Cookies just to play with sprinkles! I pulled out the brightest variegated DMC floss I had. I was being lazy, my first thought was to use Caron’s Cranberry Water Lilies, my favorite Caron color—well, one of them anyways! But that would mean I had to get up and dig in the overhead storage to pull it out. I had my box of DMC 000 – 500 at my side. So I went kind of random. My doodles included lime green, orange, fuchsia, red, purple. You’ll see some of those colors in the beginning of my new baby, The TAST 2012 Quilt! Block One is not done yet, as you can see. I’ll show it to you when it’s done, too. And you’ll see the other limbs of this new baby as they develop. Since TAST will most likely run over into January, this baby has the traditional nine months to go. I’m sure there will be additional development once delivered! 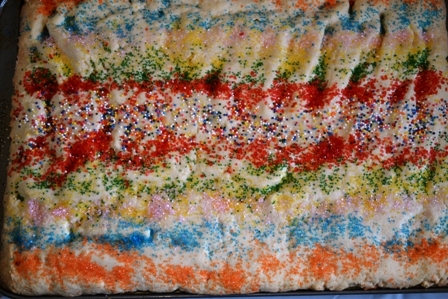 I’m thinking there will be a theme tin addition to TAST with this project. Something regarding attachments. For me Dark Nights of the Soul often involve my relationship to attachments and loss. This trip from hell involved the possibility of loosing our home and the ability to fulfill our dreams. We were also in life threatening situations a couple of times. We had to spend everything we’d saved to live on for the rest of the year to make it home. And my special puppy who I’m very attached to started with the symptoms that have erupted into a horrid flu-like illness that she is currently struggling with. I have learned that such situations are part of the cycle of life and also the creative cycle. Just as wild fires clear the brush to allow for new growth, human life crises lead to a kind of soul cleansing making room for new ideas, new vision, and a heart that is more open and available to input. 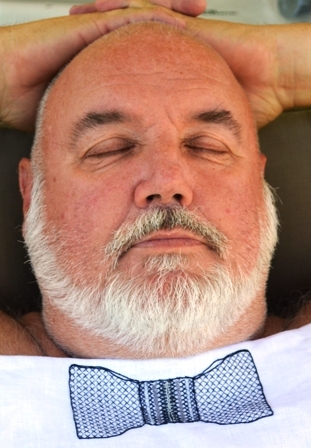 Humans are creative beings unless we get bogged down with minutia rather than process, routine as opposed to ritual, and habit instead of awareness and engagement. Sometimes it takes a lot to clear out those barriers to be free to create. Whatever gets us to that place is a blessing. That is what I have experienced so that is what I believe! What do you think? What frees you to be creative? I may be off the grid for a couple weeks. On the 17th we hook up and hit the road North. I’ll keep on stitching though. And I hope you do, too. Would love to hear what you’ve been up to while we’ve been dodging tornados and trucks! Keep me posted by leaving a comment! You can always post a private note by using the comment form in the TSS Mission section, too. 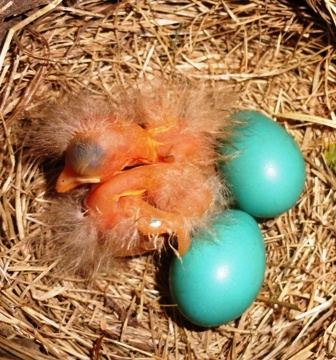 The State Bird of New York is the Bluebird. I can count on one hand the number of times I’ve seen a bluebird while in New York state. I’ve seen quite a few since we’ve been spending time in Mississippi and Alabama. And now that it is spring I’ve been seeing even more. They are beautiful! Jeff has been watching the endangered Gopher Tortoises make their way out of their tunnels to warm themselves before it is time to lay their eggs. I love spring! I also love fall. All the colors and the contrasts are so beautiful. Life just seems so close and the Cycling of Mother Earth is so palpable. 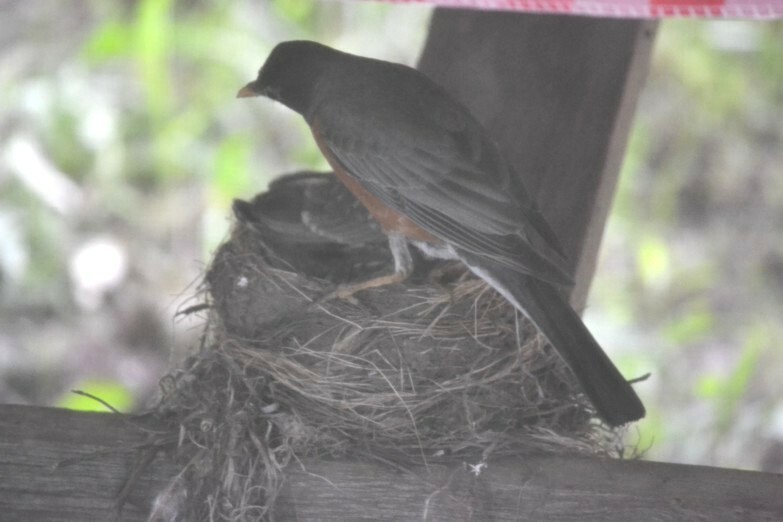 Last year a crazy robin built a nest in the cross boards of our picnic table that was right outside our bedroom door. 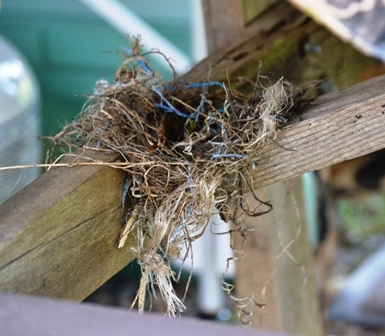 Every day for about a week we would see the new fixings until there was finally a gorgeously and neatly woven nest. This robin is persistant! One of about four false starts. 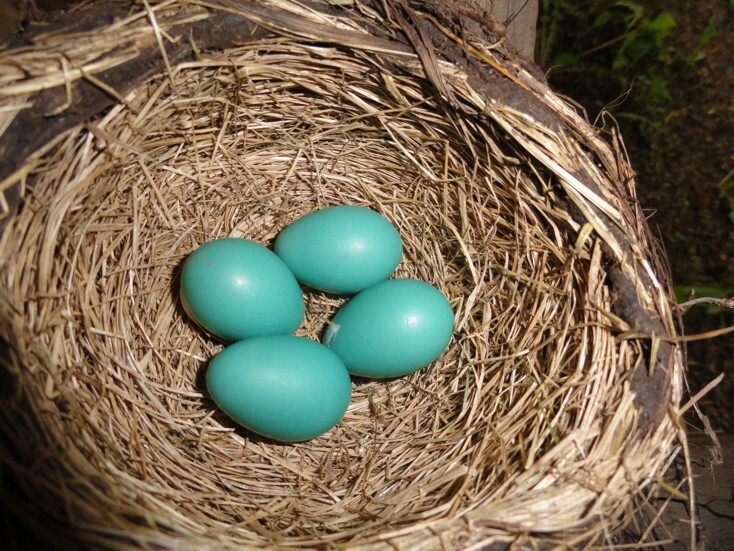 Day by day we watched as the mother laid one egg every day until she had 4 blue eggs side by side. 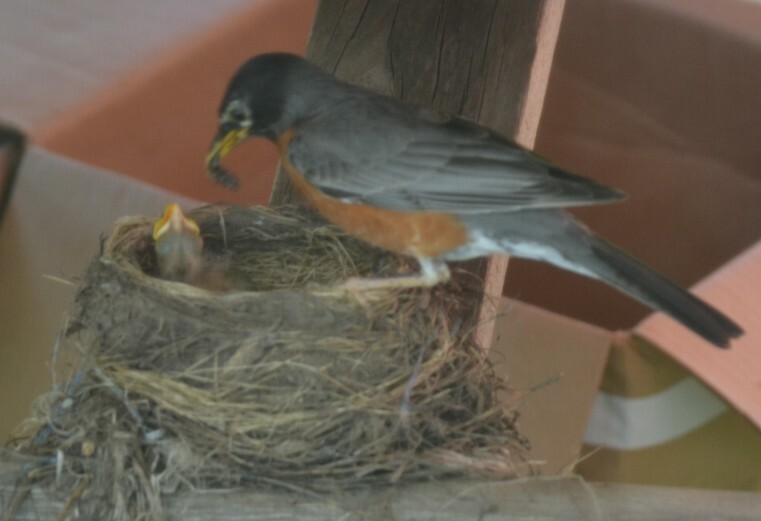 I was so worried because it was still kind of chilly out and everytime we opened the door the mother would fly away. I was afraid the eggs wouldn’t hatch. I think I drove Jeff crazy with my worrying. But I think the mother got to know us and if we were careful we could walk into the bedroom and watch her watch us. "Do NOT mess with me!" Finally, one day there was a tiny orange fluff ball in the nest. And the next day there were two. 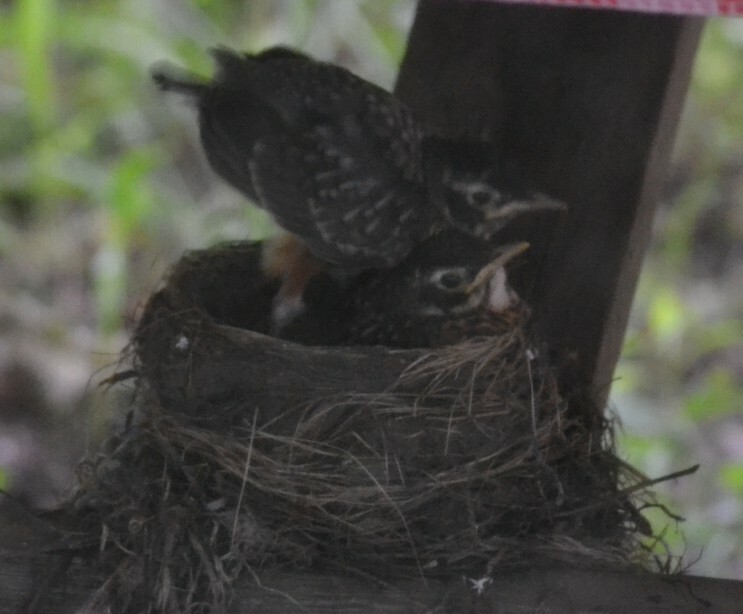 Mama bird kicked one egg out and the fourth just never hatched. I wondered if it was our fault. One is so new it still has shell attached! 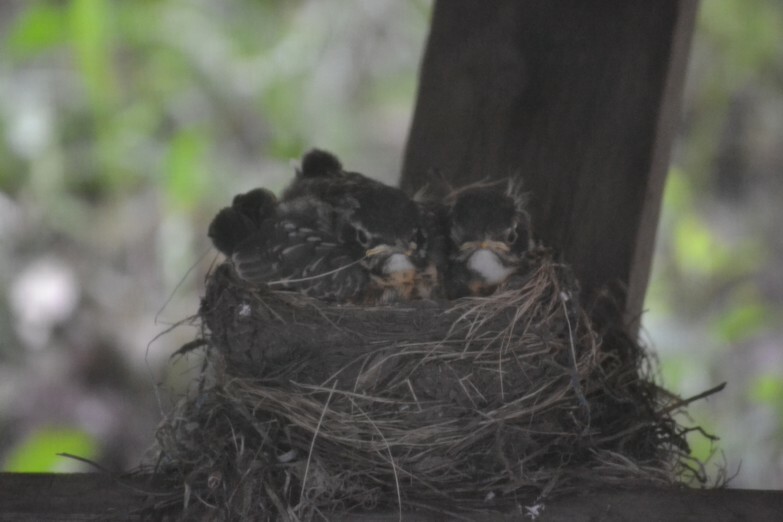 Mama bird fed them and so did papa bird. These kids ate a lot! 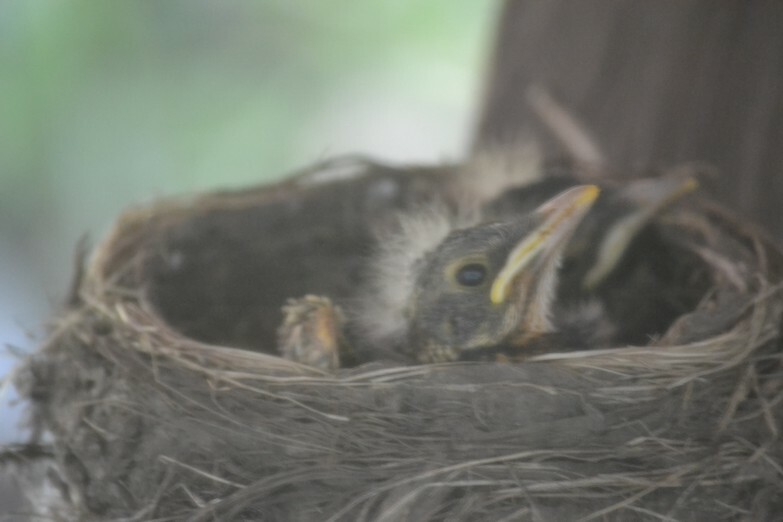 And it took some time before the hatchlings actually looked like robins. We are robins, red breasted all! Then they started to move around the nest, walking around the edge. Then one day they were just gone. Never even said good-bye! 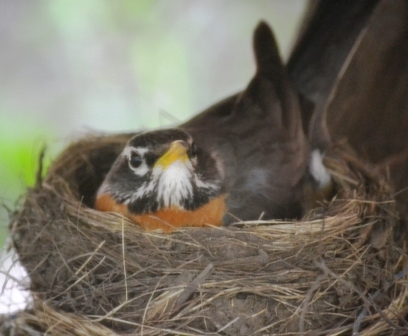 But then we noticed there were other nests around us. One in a neighbors satellite dish. Another under the front end of a fifth wheeler camper. They were for robins. 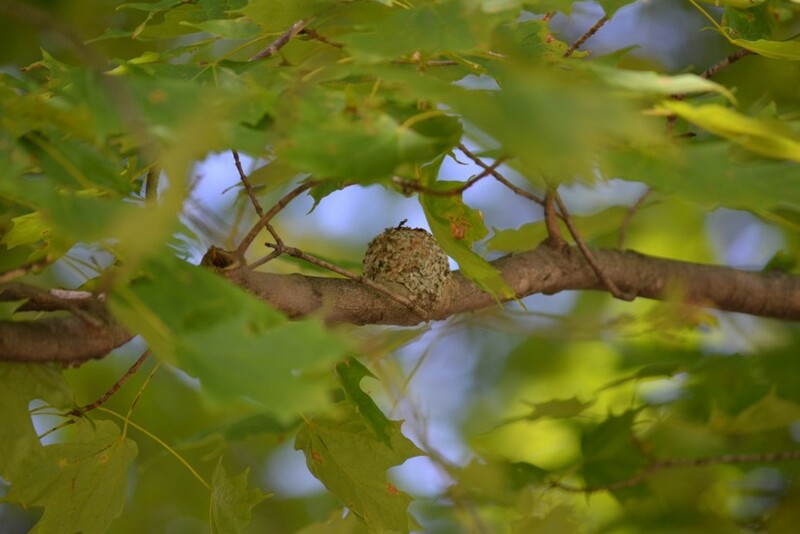 Then we spotted this one…a hummingbird nest with a new family, too. 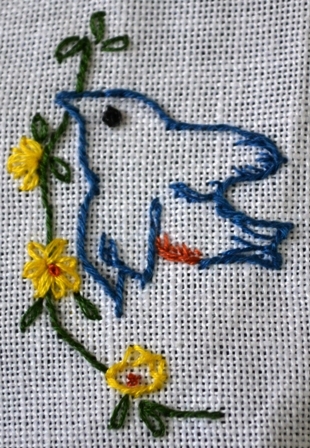 So in honor of all the beautiful birds that are nesting right now in this week’s TAST Challenge to use the Stem Stitch, I stitched a little bluebird. Here she is, with a stem stitched sprig of spring to begin her new nest! I hope you like her! But tell me….What inspires you! I have added several blog links to this page. Please check them out. The work these artists do is incredible. You won’t be sorry. I promise! Check out my UFO Inventory by clicking on the tab in the header. Then join me in completing some old dreams! 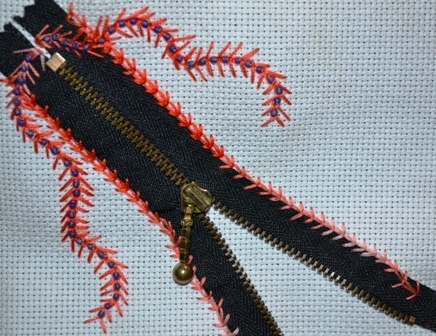 I had so many ideas for what I’d do with Satin Stitch, the 13th stitch in Sharon Boggon’s Take A Stitch Tuesday challenge. First I was going to do some musical notation for the song “Here Comes Peter Cottontail,” but found it was copyrighted. Then I was going to make a band of bunny ears in various states of awareness. But that seemed kind of boring. I also thought about not stitching at all because I have so many projects that have Satin Stitch in them. But, this is not just about learning the stitch, it’s about challenging one’s self. And truth be told, I hate Satin Stitch. I’m always worried about coverage and pulling too tight. I want it to be perfect. I like using it in needlepoint on canvas or congress cloth because I use a laying tool. For some reason using a laying tool seems kind of heavy-handed on linen. 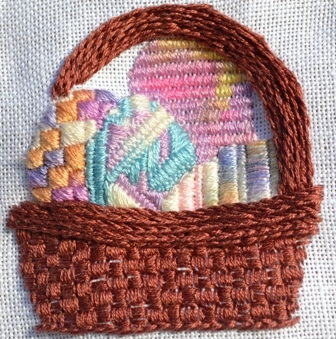 I used DMC 3858 (2 ply) for the basket. I wasn’t happy with the coverage so I increased it to 4 ply for the rim and handle. The eggs were done in four different Caron Waterlilies. The two furthest back I’m not sure which Waterlilies—leftover threads from other projects done long, long ago. The one on the right front is 013 Peach Sherbet. The one to the left of that is Tropic Seas. The directions for Waterlilies says to use 1 ply for 22 count linen. Since the Sampler is done on 32 count linen, I used 2 ply for the first egg I stitched, the one in the very back. I didn’t like the coverage, so I used 4 ply on the egg in the front right. That seemed kind of puffy, so I used 3 ply on the remaining eggs. I think that was the best coverage. What do you think? What would you do to improve this little design and my Satin Stitch? Please do leave a comment as I think I need to do more work on this, but am not sure what exactly is needed. Help! This week there is a break in TAST 2012 to give stitchers whose lives have gotten really busy a chance to catch up. After all, if you get frustrated and so behind the challenge might just become another UFO! And Sharon Boggon is all about setting people up for success! 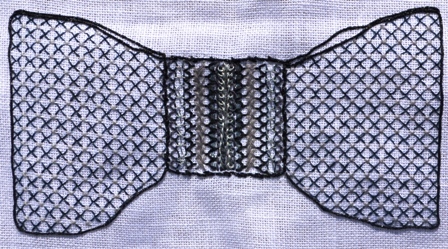 I will be posting more details later this week on my blog, Blackwork Lessons, after I create a clean copy of the pattern and directions. Followers of Blackwork Lessons and The Shop Sampler who leave a comment requesting a copy of the pattern will receive it, gratis, of course!